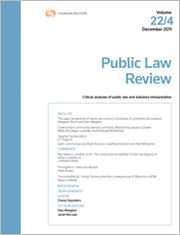 Public Law Review (ISSN: 1034-3024) is an influential and widely cited legal journal. The articles and commentary allow readers to stay on top of public law developments in Australasia and in other parts of the common law world. The subject of public law is broadly conceived, covering all aspects of law and government. A feature of Public Law Review is the commentary, recent developments and book review sections, bringing to public lawyers in government, private practice and the courts coverage of topical issues and legal literature. Articles published are critically appraised or reviewed by an academic or professional peer of the author for the purpose of maintaining the standards of the journal. The latest Part of the Public Law Review includes the following content: Comments: “‘Unison, the Parole Board and Principle of Legality'” – John Basten; “The Unison Case: A New High-Water Mark” – Richard Rawlings; “Conceptualising the Principle(s) of Legality” – Jason NE Varuhas; the following Articles: “Party-hopping Deja vu: Changing Politics, Changing Law in New Zealand 1999–2018” – Caroline Morris; “Two Reflections on Retrospectivity in Statutory Interpretation” – Dan Meagher; “Rethinking the Henry VIII Clause in New Zealand” – Sean Brennan; Book Review: “Religious Freedom and the Australian Constitution – Origins and Future” reviewed by Mitchell Landrigan; and Developments. The latest Part of the Public Law Review includes the following content: Comments: “The Incorporation by Reference of Technical Standards in Legislation: A Developing Issue” – Stephen Argument; “Expanding the Entrenched Minimum Provision of Judicial Review? Graham v Minister for Immigration and Border Protection” – Lisa Burton Crawford; “Judicial Enforcement of New Zealand’s Reserved Provisions” – Andrew Geddis; and the following Articles: “Unveiling the Public Interest: The Parameters of Executive Discretion in Australian Migration Legislation” – Gabrielle Appleby and Alexander Reilly; “An Impasse in New Zealand Administrative Law: How Did We Get Here?” – MB Rodriguez Ferrere; “Non-statutory Executive Power” – KM Hayne; and Developments.